That's a wonderful presentation of my tutorial list! The biggest baddest one is yet to come. I hope you'll make it the no.1 tutorial in the list. Imho I hope to make it THE Carrara reference for large scenes. First up finish episode 8 so people can see what is possible. Thanks again for raising the profile of my work. I keep adding them to the top of the list as you make new ones - but I may have mixed them up(?)... Don't think so... but I can always rearrange them to 'your' liking, my friend! Thank YOU!!! This is a useful resource you are building here. keep on keeping on my friend! This is always the first place I look for answers in my quest to become a real Carrara user. Thank you for all the hard work you're doing on this. First: thank you for your lists and tutorials! Second the link above doesn't work anymore - or better Magaremoto's link doesn't work anmyore. Second, Thank You for bringing this to my attention! As somebody new to Carrara I can use every help I can get. :)Yes magaremoto, you have MY thanks for this as well!!! ...and Kerya, I know exactly how you feel! I have spent three years now having an absolute BLAST :) working away in Carrara learning as much as I can. The urge to make my own animated movies is what drew me in to Carrara in the first place. Poser and Daz Studio are really great for this as well, but Carrara's modeling ability, fast ray tracing render engine, and multitudes of animation friendly tools have been making my endeavors much more doable, better looking, and much, MUCH more FUN!!! I would just like to share, that I have found that Magaremoto's Excellent Carrara Products, as with those from other DAZ artists, are not only great to add to the browser library for what they are, but are also a valuable way to learn new techniques to do things. I have just recently purchased his Props for Landscape Scenes: 15 Shaders for Exteriors so that I can glean more Texture Room Shader-Tweaking skills from masters like him. The Carrara 8.5 Setup Guide is a strongly recommended read for everyone installing Carrara. Don't be confused at first, by the long lists of included stuff. Just take your time, start from the top and work your way down. This guide gives you the opportunity to choose from either method as you go: Use the DIM, or not. And if you do not use the DIM, you'll need to follow through the rest of the guide reading the instructions in each step for Bitrock Installer methods. If you do use the DIM method, you'll likely find the entire process very easy from here on out - but it's good to follow through the rest of this short document anyways. that I'd like to point out, before you get too far, is that I didn't see mention of removing previous install locations from the DIM, if you've removed those copies of Carrara. If you have uninstalled previous versions of Carrara, and have had the DIM installed, you may have an installation path for Carrara within the DIM. Click the little gear in the upper right corner of DIM. This opens the Settings dialog. Open the Application Paths tab and look to see what versions of Carrara you have listed for paths. If you have other versions listed that are not in use, remove them by highlighting the path and click the minus "-" sign below. Otherwise, Carrara content will get installed to that path as well as the new one. If you wish to keep other versions of Carrara installed along with your copy of version 8.5, then keep their paths allocated within the setting of the DIM - so that they, too, receive installations of Carrara products. DIM is supposed to install Carrara products to all Carrara paths listed. If you are a veteran user whom is not planning to use the DIM yet, simply select the blue, download buttons from your DAZ 3D account > Product Library to your desired location. Most all installers have been replaced by .zip files, but not all. You're likely well aware of the Bitrock Installers, but just in case: Simple launch the installer and make sure that the path of installation goes to the correct Carrara installation path. If you use more than one version of Carrara, you may need to do this more than once. The new zip format downloads contain a manifest file for the DIM to read. This is handy if you ever decide to go by way of DIM, simply placing this zip file into the DIM's Downloads folder will give DIM the access to install the files for you - and catalog their existence in the database. Otherwise, simply open the Content folder within the zip. Carrara content products simply install directly to the installation path directory. So you simply open the zip, ignore the manifest and open the 'content' folder. Now drag the entire contents into Carrara's installation folder. I can totally understand being reluctant towards the DIM. For a person like me, whom buys most everything, with very few exceptions from DAZ 3D, it really didn't make any sense to not use it anymore - especially since I'm going for the gusto, and going Carrara 8.5 Pro, with full intentions of making the most of Genesis and the up and coming Genesis 2 - and all of the new Triax stuff that the future holds. There have been many changes very recently. Changes in Genesis, Daz Studio, Carrara, and content - including how that content gets delivered. DIM is an ingenious method created by the makes of Daz Studio Pro, for us to download and install our products easily and correctly. But even more, it has the ability to detect updates to the things that it has installed to our computers - and update the files for us. The whole process is amazing - and I'm glad that I've finally taken the plunge. Only use DIM to install what is not installed. If you want DIM to install something that is installed, get rid of it first! WARNING: If you already have a large runtime collection, do not write into the existing runtimes with DIM. Write to new runtimes that you create using DIM instead. Genesis is ultimately important to keep straight. Never have more that one installation of Genesis or any of its supporting content. Never install over existing Genesis or Genesis support products - always uninstall first! The final statement above is very important - and the DIM knows exactly how to do it perfectly, time after time. It is when people do not heed that advice, when you'll see posts about I/O Errors, and duplicate files errors... if the problem starts to take hold, the only plausible fix, aside from weeks of combing through file folders, knowing exactly what to do, is to remove everything and start from scratch. This is why it is best to keep Genesis up to date, the right way. Which means a fresh install directly after uninstall. The way DIM does it! I have to install on a machine NOT connected to internet. I am downloading individual components to move to the stand-alone computer. Most components offer 3 versions: Genesis, Genesis Legacy, and Genesis PoserCF. Am I supposed to install all of these? If not, which one? Unless you have Poser, and want to use Genesis with it, ignore "PoserCF". You may also ignore "Legacy". Now, since you need to download and install later, you can do that two ways, that I know of. 1 - Use the DIM to download, but not to install. 2 - Choose the Blue "Download" buttons in your Product Library of your DAZ 3D account. If you wish to install everything manually, this is THE BEST option. Now, you don't need Daz Studio anymore to run Genesis stuff. But you'll still need a Daz Studio Library to install your Genesis-related stuff to. That's just an example. Frankly, it could be anywhere, I guess but with one very important rule. Always install your Genesis stuff to one library. Well that's not even true, but it helps to make life a lot easier. Just make sure that Genesis, itself, never gets installed to more than one spot. If you have the option to install an uninstaller for Genesis stuff - DO IT!!! Before re-installing anything Genesis, it usually wants an uninstall first to avoid getting errors when trying to load in Genesis - preventing it from loading. This is where it's nice to just run the DIM offline to install nothing but your Genesis stuff, at the very least - the ability to uninstall is HUGE! Reason I say that is that you'll see posts all over the place where folks are getting I/O Errors trying to load Genesis to no avail. It is my belief that this is due to old files that should have been removed are still sitting in there. However, if you decide not to use DIM, and you run into these problems, I've found that it works to simply delete the whole library and download/install the latest files. This is easy for me, since the only thing I ever install to the location where I install Genesis to, is Genesis stuff, Plus the newest DAZ animals, which so far is just the Daz Horse 2. I should be around today - but I'm only checking the internet every so often - but I'll check back in a bit to see if you have any more questions. I have already downloaded ALL the files. I will only install one of each, one at a time. I'll find my previous folder of Genesis and install Genesis stuff there. Before I ask more questions, I'll attempt to install the content. I have downloaded the files, moved them to the stand-alone, extracted the files on a couple of zips, and found no installer. I located a path for things like presets and data, etc. and placed the extracted files there. Is this the procedure I must follow for all the components? And when I get to a "Runtime" folder, is that placed in my user/DAZ folder? Well, the way most people do it is, inside the zip, open the 'content' folder and just drag the contents into the library folder. The folders and files will just merge. What I was saying in my post about using DIM, is that this process will not 'uninstall' any existing version of whatever you're now installing. A problem could exist in that, if some file was supposed to be removed, it doesn't. That's one of my favorite things about DIM - is that it creates uninstallers for everything as it installs. People who have left those unwanted files in are the ones getting the errors. So if you are opening things up that far, do that only for the products that have already been installed - simply to check to see if the original folder holds more files than the new one. If it does, isolate and omit the files that do not exist in the new one. This could take a long time, however. There may be a possibility that, if you installed the products using a Bitrock Installer, like they used to do, you might have let it create an uninstaller, in which case, there is an uninstaller folder within the library folder. Just run the uninstaller of anything that you are now going to install. This doesn't help you out for the next time, because drag and drop doesn't create uninstallers. This really isn't supposed to be a headache experience. Thanks!! No headache here... but I will probably have a stiff drink when I get home. I'm placing all the extracted files into corresponding locations in the program folders.... including any runtime files. I'm just opening folders until I don't find a matching folder and place the new folder there. If this doesn't work, I will get the gov't computer admin to install DIM on this computer and start from scratch. I'll join you on that stiff drink. UPDATE: Was able to install DIM... used the download (no install). Dumped anything related to DAZ 3D on the stand-alone and started from scratch. Transferred files and DIM to stand-alone computer and install went well. Still trying to find out which folder to place "My Objects". It did reside in "My Presets", but I can't find a matching folder in the new install. P.S. : I think Sailor Jerry helped. If you're talking about the My Objects folder for the Object Browser, you could always create your own where you want it, and manually add it to Carrara's browser, by clicking the little black icon on the top far right side of the Browser window. You'll have the option to add a folder, simply navigate to it in the dialogue that opens and click Okay. It will appear at the bottom of the list in the Objects Browser. 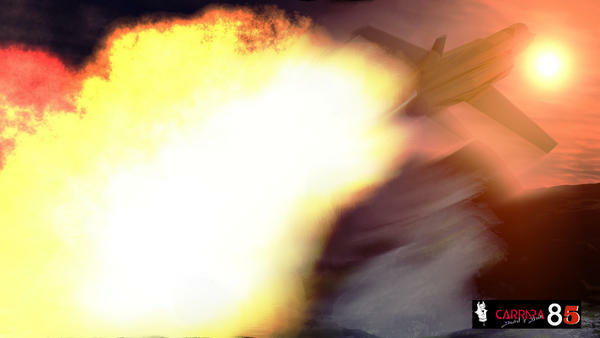 In the event that you don't get a DAZ 3D > Carrara 8.5 folder in your My Documents folder, I believe that all you need do is to fire up Carrara for the first time, perhaps open a few things, you know; play around a bit. It should make one. After using CARRARA, it created the folders, My Objects, My Presets,. etc. NEW Question... is there any way to separate the browser from the sequencer tray? It would be nice to view both at the same time and I have more than enough desktop space. I have 2 30" monitors... the left has full screen 3D View. The right is where I dock the tools and properties windows and the bottom half has the sequencer (and browser tab). I have all this empty space that is just begging for the browser window. I was just about to say "no", because I can't, nor can you at this moment. If there's some clever way of doing it, I'm afraid to say that it would require a plugin at the very least - one which I have never seen to exist - and one which I have serious doubts that it can exist... just sayin'. Hmnpf! Sounds like a cool thing, though... I hope I get proven wrong on that initial "no" I caught myself almost saying! Please note that the link to the SDK (from this posting) is now dead. I have a lot that I want to fix and a lot that I'd like to write and show. It's really cool though... I'll get a few seconds to just pop in, pick a topic and open the reply window and just start typing. That's why I 've missed some posts - 'cause I'll have that reply window open for quite some time before I finally finish typing and hit send. Here the link to the SDK: http://carraracafe.com/downloads/?did=23 rk. Side note - I think it's kind of a bummer that things like this shortcut map document is something that requires a Cafe Login. To me, this should be something that any visitor should be granted access to. But that's just me. 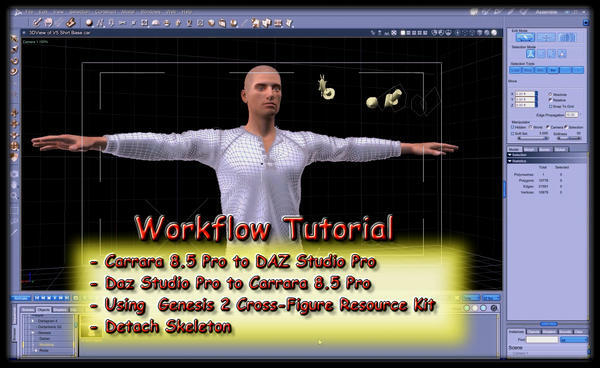 Since the addition of Genesis compatibility to Carrara, we now have the ability to use the Triax rigging tools in Daz Studio Pro to our advantage as Carrara users. By using that type of workflow, what we end up with is actual conforming items in our libraries, just as if we purchased the stuff from the store. I will be expanding this post with more links as we go. But I needed to get a start - and I fell that this is a good one! Check out this new tutorial by DAZ 3D: Less Can Be More! Here is my first tutorial specifically regarding this subject: Workflow Tutorial - Conforming Clothes for all Genesis figures. I hope you enjoy it. It was my intent to be brief, yet to explore the basics of the process in their entirety. It's easy to master this part of it. After we become more practiced, we can delve further into the sweet tools and their improvements. DAZ 3D has been pouring tons of enthusiasm and ground-breaking modern research into this stuff... and it shows!